They play the hottest superheroes on the planet. And five of the six original Avengers stars are now forever linked by ink. 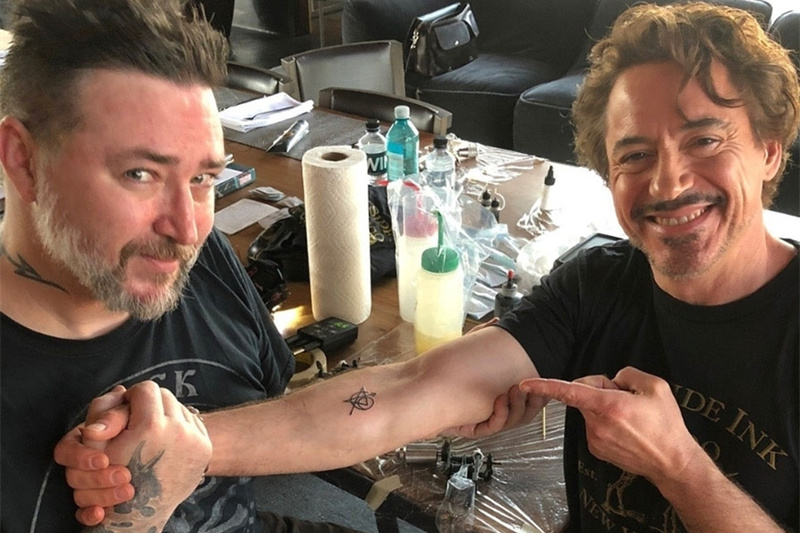 Robert Downey Jr. revealed on social media Monday that he along with Jeremy Renner, Chris Hemsworth, Chris Evans and Scarlett Johansson all now sport matching tattoos - with only Mark Ruffalo opting out of the group inking. He posted clips of Lord tattooing a symbol onto his forearm. It appears to be a stylized Avengers logo and the number six, for the original six comic book characters. Renner, who stars as Hawkeye, and Hemsworth, who stars as Thor, got the same symbol at the same time after New York-based Lord flew out to Los Angeles to do the tats. Johansson, who's the Black Widow, and Captain America Evans already got theirs in the Big Apple. Downey Jr., 53, told EW.com that it was Johansson who had come up with the idea and persuaded the others to join in. Marvel's the Avengers hit the big screen in 2012 as the sixth movie in the Marvel Cinematic Universe. Their most recent adventure Avengers: Infinity War broke box office records when it premiered on April 27. Infinity War crossed $1 billion at the global box office on Saturday, faster than any title in history, THR.com reported Monday. The film now has a shot at reaching the $2 billion worldwide mark as it has yet to open in China, which it will do this Friday, May 11.